Golf is fun - or at least it should be. You hear it all the time, especially from those professionals who attempt to make their living playing the game. “I was just trying to have fun out there,” is the common cliché in an interview. So, if we're all “trying to have fun out there,” the logical progression should be that golf is funny. Well, we certainly know that's the case. Funny stuff happens consistently on a golf course. We might not view it as amusing at the time, but later, upon serious reflection or a visit to the 19th hole, it certainly produces a smile. But with all these shenanigans happening on the course, very seldom does some golf scribe take time to catalog these amusing incidents. They are too busy analyzing the game attempting to elucidate on the perceived thinking of the great players. The lot of golf books written from the humorous angle is quite slim. Fortunately, we now have a new volume that will surely put a smile on your face and often get you to laugh out loud. The culprit is Bob Cayne and his monumental work on humor in golf is entitled “...Nothing Major.” Cayne is the former co-host of “Talking Golf,” a weekly radio which he shared with Cleveland Plain Dealer golf writer George Sweda. Cayne has compiled 219 pages of quips and clips from the radio show and his years in golf. 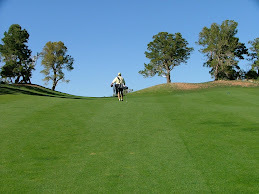 The result is an anecdotal walk down the fairways of golf. Virtually every page will have you cracking a smile. Cayne displays a waggish sense of humor and his writing style is what definitely adds to the fun of the book. His clever use of metaphors and similes adds greatly to the humor of the book. You'll want to read (and perhaps re-read) the complete volume, but here's an appetizer of what's in store. Be sure to read the chapter entitle “I'm 74 Years Old, or Two Over Par.” It'll give you a finer appreciation for senior golfers. I also found this book to be “educational.” In the chapter “The Laughs Are On Me” you'll discover why golf should be taught from the green backwards. And finally, as part of the educational process, you'll discover why golf equipment and personal grooming products are marketed the same way. If you love golf and like to laugh a little bit at the game and the antics that go on around the game, “...Nothing Major.” is a must for your library.